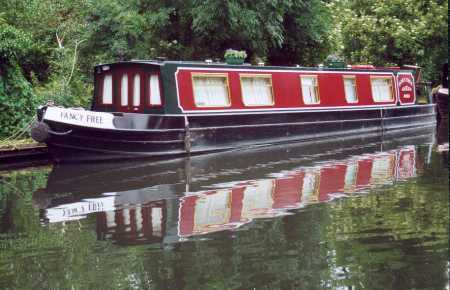 1997 Reeves shell, originally fitted out by Aynho Wharf Boat Builders. 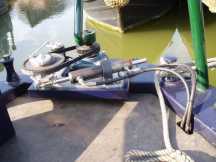 Beta marine 43bhp engine; 9hp bowthruster added in 2001. Well, we made it! Two rivers, three canals, 98 miles and 104 locks in 11 days. 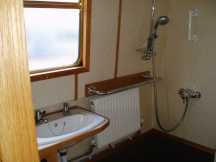 The work we had done this winter to our narrowboat has certainly been worthwhile. It all happened like this. 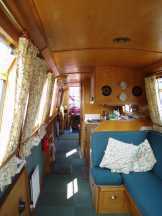 When my wife, Isabel, and I retired early in 1997 we bought a 52ft narrowboat. At that time I was just starting to have some difficulty with walking and Fancy Free proved a wonderful way of getting us out in the fresh air together. 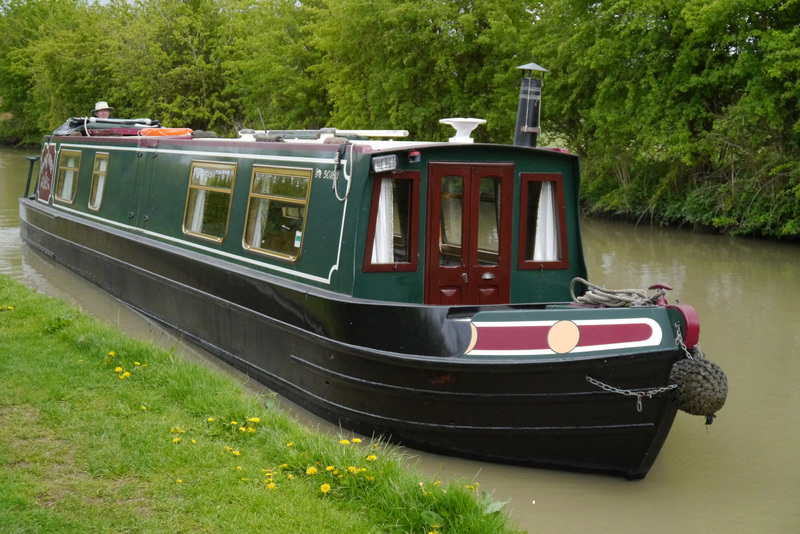 Isabel could walk along the towpath as much as she liked and I followed on behind on board, bringing the gin and tonic with me. 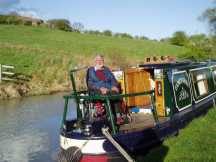 As the years passed I could do less and less off the boat, but continued to steer and control her while Isabel worked all the locks. By last year my disability had progressed to the point that we either had to make some radical modifications or give up boating all together. 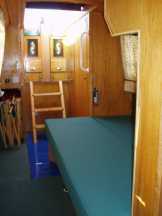 We asked Ian Cundy of Starline Marine, Upton-upon-Severn, to advise and help us and this winter he widened the rear hatch and the gangway to take a wheelchair, installed a hydraulic lift, fitted remote power steering and engine controls , installed a second alternator and revamped the interior of the boat including an under floor stainless steel shower tray in the bathroom. It has worked out well. 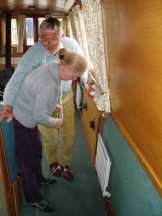 Before the gangway was widened I could traverse the length of the boat only by having a piece of rope round the back of my neck with loops over my feet and Isabel pulling the rope to move my feet forward one at a time. Now I can get all the way to the lift in my wheelchair.The lift can take me up either to rear deck level or a few inches higher to improve my view when steering. 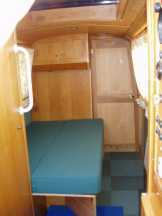 At night when the lift is not needed the room can revert to a double bedroom. and here, left, is the other one. 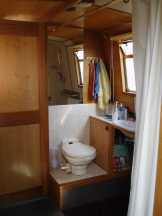 When these doors are closed the bathroom extends the full width of the boat for easy wheelchair manoeuvring. 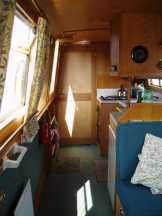 When the doors are opened the gangway is once more ready for use. 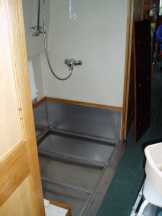 The underfloor stainless steel shower tray can be seen more clearly if the floorboards are lifted. 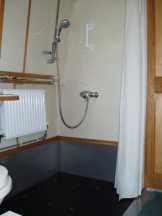 The chromium towel rail is also a grab rail helping me to get out of my wheelchair onto a perching shower stool. The loo and holding tank are now 8" off centre but this does not seem to have created much of a problem. and the boxes on the rear bulkhead to which their leads attach. 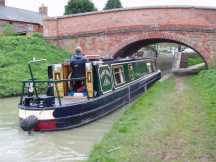 Steering into lock 16 at Marston Doles, the 104th of the journey. As well as the lift being above deck level I am sitting on a 6" thick cushion to give me added height. 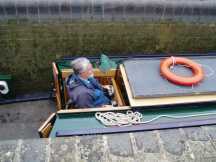 Inside the lock waiting for Isabel to open the paddles. The remote controls are sitting on my lap where I normally have them. It was all very costly, but certainly worthwhile. 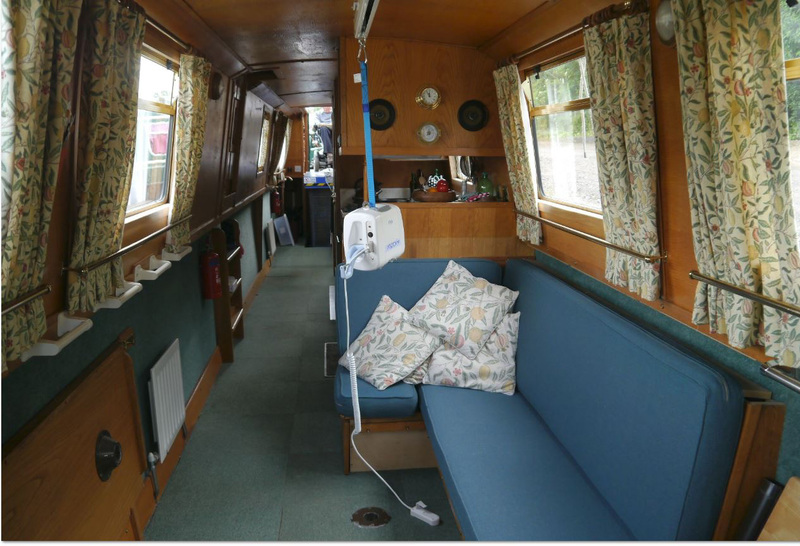 Widening the rear hatch, supplying and fitting the lift, revamping the rear bedroom, the bathroom with its disabled friendly shower, the galley and the L-shaped seat/bed in the saloon - £13,500 . 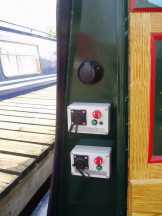 The joystick steering system - £4,850 and the engine control system - £2,350. 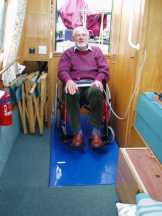 I now have an electric wheelchair which lifts me a few inches higher than before and I have a wooden shelf across the hatch to support the joystick controls. We have had a canopy put over the rear hatch to stop rain getting when the hatch is open; it also allows us to leave the joysticks under cover on the hatch when this is closed. 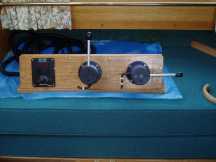 Also I now need a hoist to get me into bed and on/off the loo, so we have bought a portable Wispalite by Chiltern Invadex, for which we had a ceiling track fitted in the saloon (could easily be removed) and some rings in the bathroom. Because I am so tall we had to lower the L-shaped seat/bed by 4". It is with great sadness that we are forced by age and further disability to sell Fancy Free. She has been a wonderful friend to us over the years.